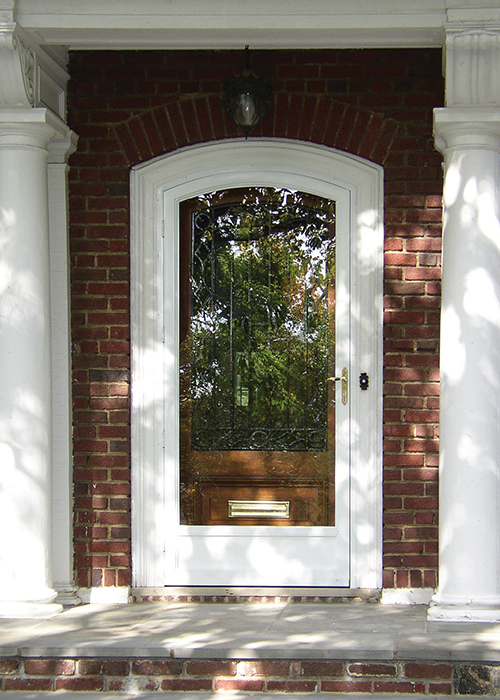 Most storm doors, including special shapes, are one of four basic styles. The removable screen and glass panel door has nearly full view interchangeable panels that can be removed and interchanged with the change of seasons. The panels are held in with aluminum color match retainer clips. The two-lite has a center bar centered horizontally in the door with a top and bottom interchangeable glass and screen. Both panels are held in with aluminum color match retainer clips. 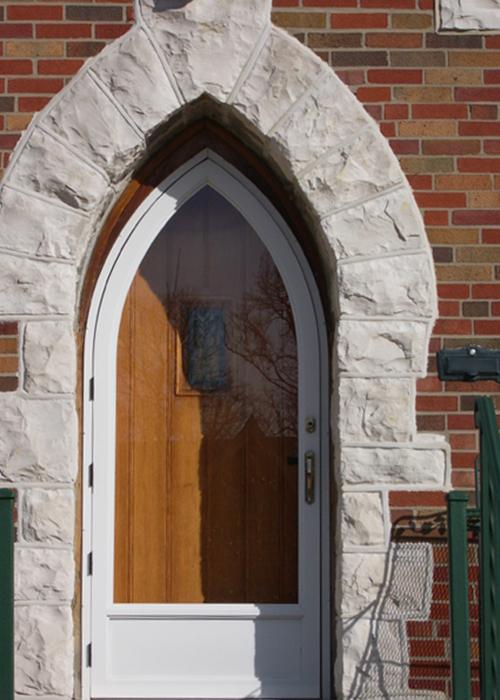 This style is an upgrade from the full view door. 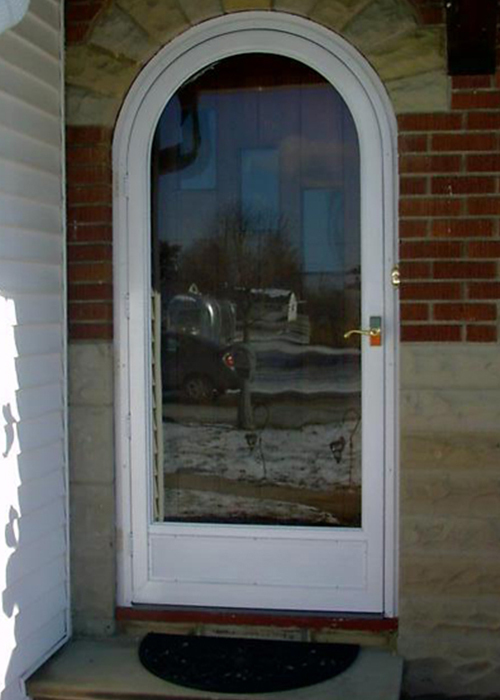 This type of storm door does not require that the panels be taken out or stored. The top glass is fixed while the bottom inside glass panel moves up as far as the beginning of the arch for ventilation. The bottom outside half screen stays permanent and can be rescreened from the outside. 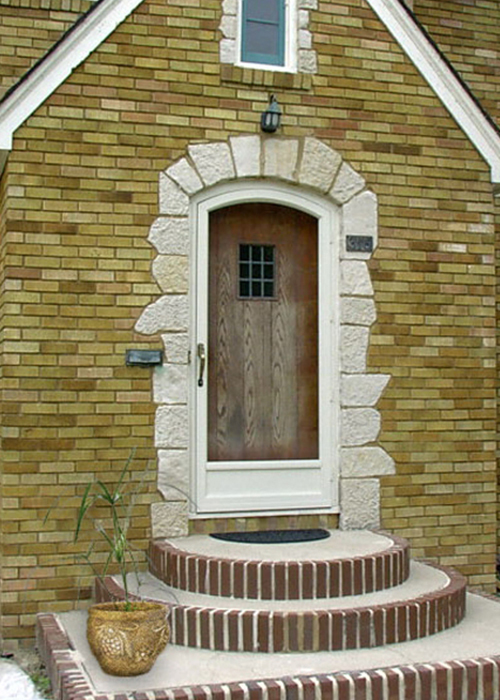 This style is an upgrade from the full view door. The half view style is our newest and works well for homes with pets, small children or where enhanced security is desired. This style is manufactured with only the custom top portion having an interchangeable glass and screen. The bottom portion, which can be reinforced either vertically or horizontally, is an all aluminum panel that is separated and reinforced either vertically or horizontally. 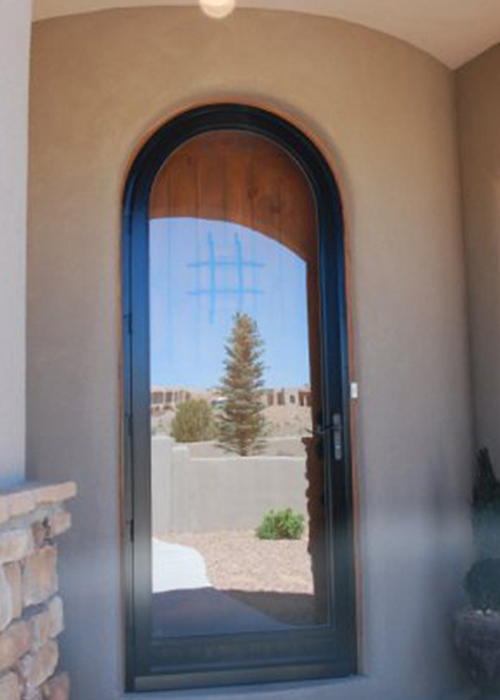 As an additional upgrade, the bottom panel can also be insulated between a double panel of aluminum but will have the screws securing the two panels visible from the inside and outside of the door. 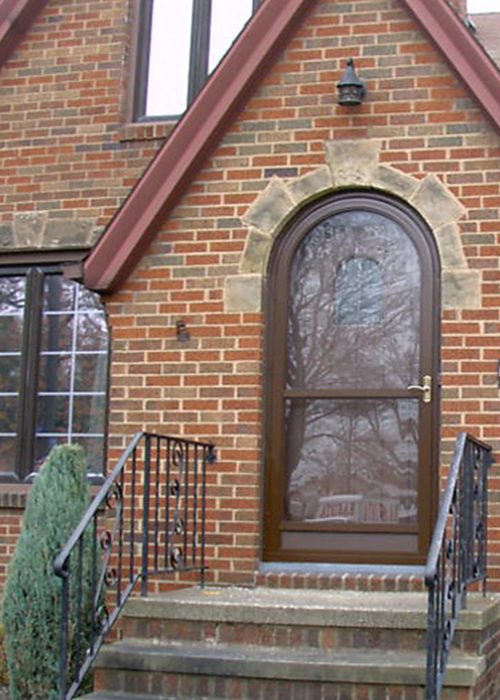 This style is an upgrade from the standard full view door. 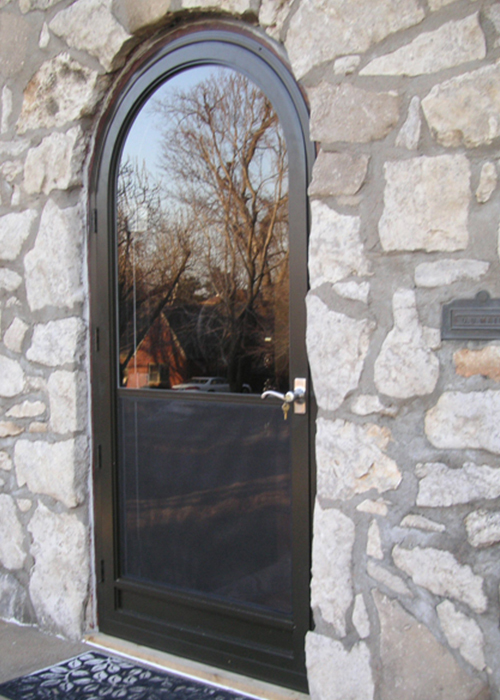 Doors are constructed of .065 smoothface tubular extruded aluminum with a door thickness of 1 1/8”. All door corners are internally reinforced with 1 X 5” extruded aluminum corner gussets and reinforced with 3/4” stainless steel, color matched screws. 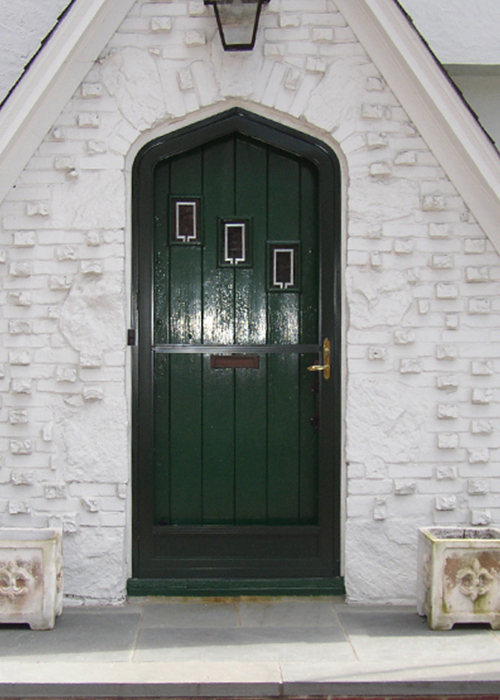 Each door is prepped through a five stage chemical pre-treatment process which provides a superior bonding surface for the polyester powder-coat finish applied to the doors, in one of ten popular period colors; all highly resistant to fading, chipping and scratching. Each door is shipped with an adjustable bottom sill that includes a double brush sweep to ensure proper fit and weather seal. Each door is pre-hung onto a seamless Z-bar with 4-5 stainless steel hinges, then protected with heavy duty wool pile weather stripping around the Z-bar. 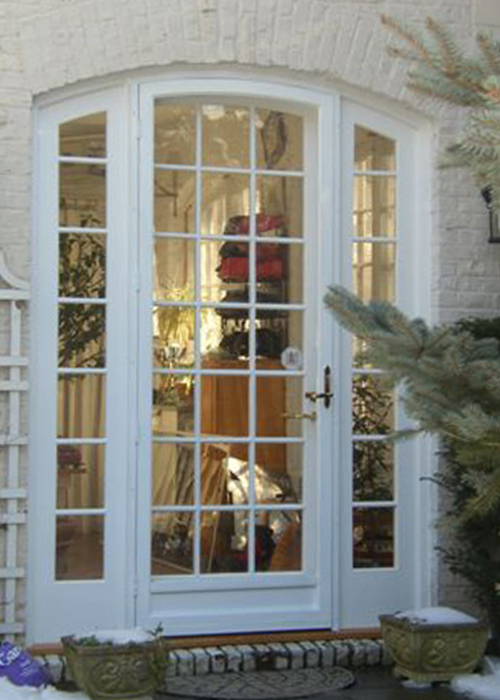 Standard, each door includes interchangeable full view screen and glass panels. 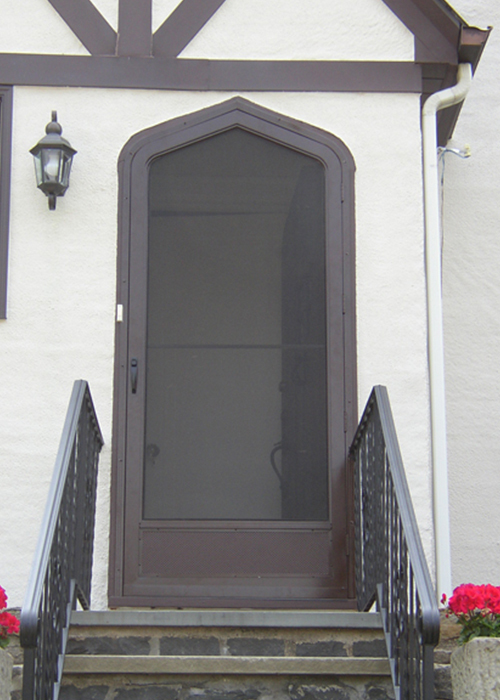 The glass panel is 1/8” safety tempered and the screen panel is 20X20 high grade fiberglass that will not dent and features a center cross bar for added strength. All installation screws are of durable stainless steel and color matched to the door. All irregular arch joints are heliarc welded for solid strength. Our standard vertical push button outside and inside handle with slide dead bolt feature can be offered with a key lock or without. See all available hardware upgrades.